2 bedrooms with 1 queen room & 1 double bed & bunks in the second room. Kitchen with full stove/oven, microwave & fridge/freezer. Heat pump. Separate living with couches, one which can convert to a bed if required and a heat pump. Bathroom has toilet & shower facilities. French doors onto the deck with outdoor furniture & bbq. Sea view from deck. A highchair & cot are available for an additional charge - subject to availability. Minimum stay of 2 nights, this is subject to change in peak times. 1 double bedroom. 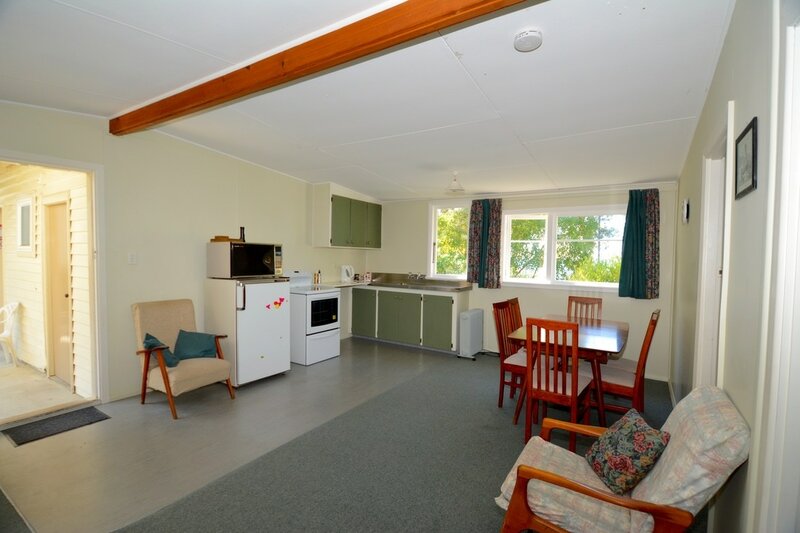 Living/kitchen has full stove/oven, microwave & fridge. French doors from living/kitchen onto deck with outdoor furniture & bbq. Sea view. Bathroom has toilet & shower facilities. Couch can convert into a bed if required. Please contact us for family rates. 2 bedrooms with 1 queen room & 1 double bed & bunks in the second room. Kitchen with full stove/oven, microwave & fridge/freezer. Heat pump. Bathroom has toilet & shower facilities. All north windows have sea views. Deck on south side with outdoor furniture & bbq. 3 ablution blocks – yes that is 3 toilets/showers/basins in a camp ablution setting. Hot water provided at no extra charge, however please think of fellow guests and conserve as you would at home. There is a kitchen which we will provide the access code to you for on check in. This includes a fridge/freezer, microwave, cook top. We know you have all your own equipment to cook with so we leave the rest to you. The laundry is shared for the Bach users and the campers. Being the size we are that works really well. We will provide you the access code on check in. There are 2 front loader washing machines – we find these conserve water well! There is a clothes drier if Mother Nature is truly unpredictable, however there are two clothes lines so please use these in the first instance. We rely on your honesty and understand that people don’t always have change, so feel free to pay in advance for the laundry on check in, or please pop in prior to departing to square this up. Baches - There is one designated double car park for each Bach. Campsites – This is limited to your own campsite. Please let us know if you have additional vehicles such as boats/trailers so we can try and accommodate these. This will be subject to availability as is limited space available, so please let us know when you book. Minimum prices & stay periods may apply during busy times. Payment options are via internet banking & cash. please contact us for rates and what’s included for stays from 4 weeks to 6 months duration. Our goal is to provide accommodation to all who chose to be in a Bach/Camp like setting that is just over the road from the beach. We believe this should be affordable for all to stay in as that’s part of our iconic Kiwi history. We provide 3 self-contained Baches and 5 powered campsites – so suitable for the tent/caravan or your mobile home. 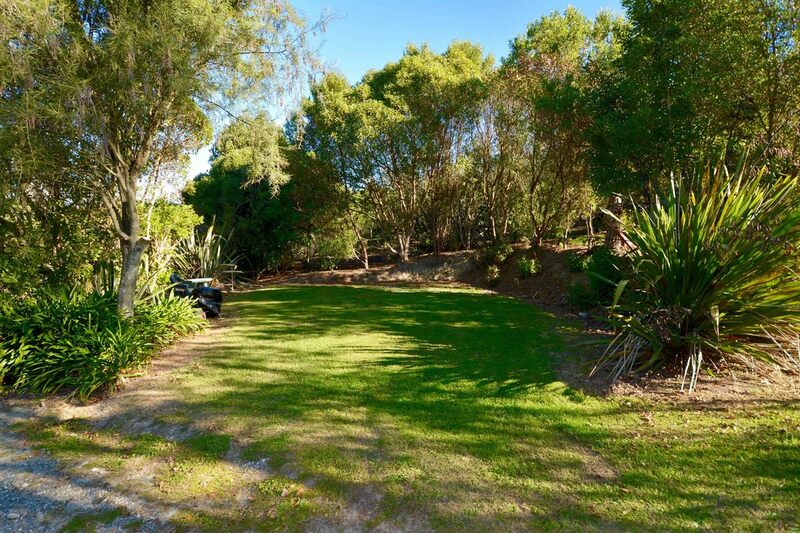 Our size is our point of difference, we don’t intend to be big, we prefer a bit of privacy with campsites having considerate native plantings, and a good distance away from your neighbour. The camp is unique. With 5 campsites we have 3 ablutions, so if you don’t want to be crowded, give us a call. Depending on bookings we may be able to provide you with your own ablution, subject to availability for those who don’t like sharing (surcharge applies). 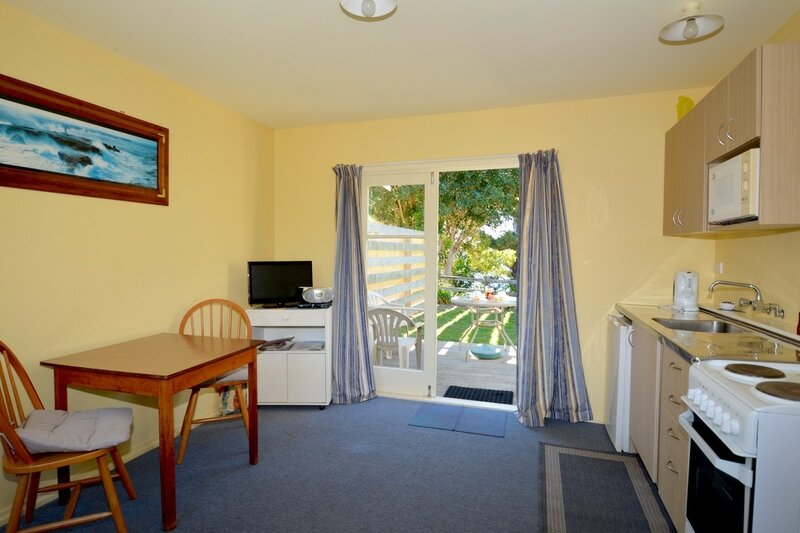 There is a spacious kitchen & laundry facility. We do not charge you for hot water in the shower, however we ask that you are mindful that we are on rain water, there is no town supply, so please conserve this precious commodity. Our water is UV filtered, so yes it is safe to drink. The water is provided for the facilities on site, as we are reliant on Mother Nature to fill our tanks, so please do not fill your caravan/motor home water tanks here. With a mixture of holidaymakers & short-term accommodation there is something for everyone! You are welcome to enquire to stay if you need somewhere to stay at any stage. 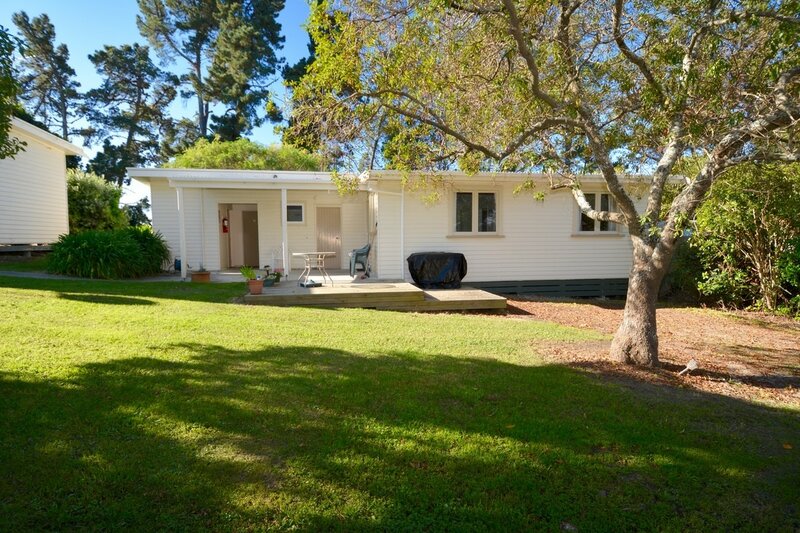 Some examples are building a house and needing somewhere to stay, seeking medical treatment, we are only 10 minutes from Mapua, & if you need the place away to write that next best seller! Maximum stay is 6 months. 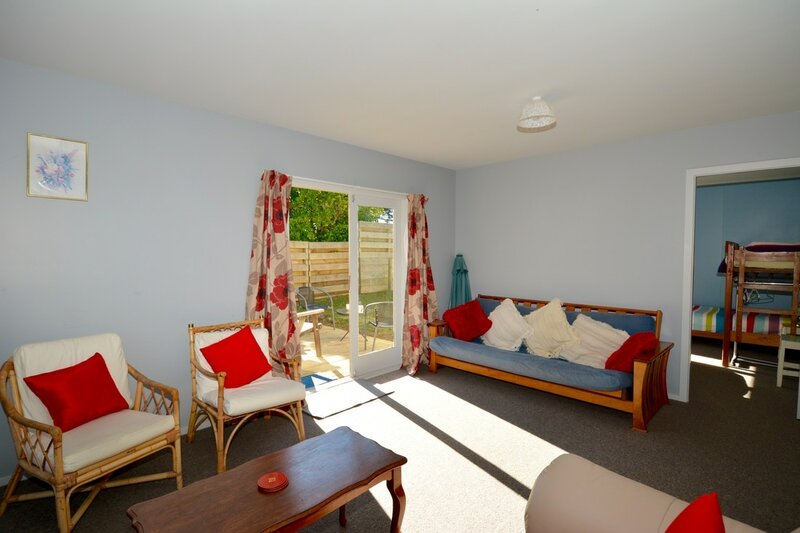 Heating options are heat pumps fitted in two Batches which will keep your seaside retreat cosy. Kina Peninsula Beach is dog friendly and please do contact us if you want to bring your family dog. We will consider outside dogs but will limit the number as we want to make sure our guests without pets are just as welcome. Obviously, like children, we expect they are toilet trained (or in nappies for a baby), obedient and good around people and other animals.